That what a lot of people would like to know. Dennis has always seemed to not say much until things are "in the can". Which for me is somewhat frustrating. A few months ago I believe he reported that recording was in process. Boomchild wrote: That what a lot of people would like to know. Dennis has always seemed to not say much until things are "in the can". Which for me is somewhat frustrating. A few months ago I believe he reported that recording was in process. I would guess it will be a digital only release if it happens at all. ChicagoSTYX wrote: I would guess it will be a digital only release if it happens at all. Not so sure about that. The label that gave him the deal is very active in releasing CDs of older bands and artists. It's what they are known for. I watched the DDY and the music of Styx concert on YouTube the other day. I was quite impressed with how great his band is. I felt like I was watching a Styx concert. Suite Madam Blue...wow! How in the hell does he have a voice like that and such breathing ability, at that age? steveo777 wrote: I watched the DDY and the music of Styx concert on YouTube the other day. I was quite impressed with how great his band is. I felt like I was watching a Styx concert. Suite Madam Blue...wow! How in the hell does he have a voice like that and such breathing ability, at that age? By taking care of his voice and not over working it. He was smart to understand it was his meal ticket. I heard him say that he doesn't feel his became an accomplished singer until he did his stint in Jesus Christ Superstar. Saw Styx the other night. Tommy's voice is so much better than it's ever been. Saw Dennis a few months ago - also great. I hear him going into head voice in different parts than he used to, but it's big and full. He sounds great. These guys know what they're doing vocally. Jy's voice has been beaten up, which is sad. People don't give JY enough credit. His head voice is such a big part of the Styx Harmony Block. If you listen to his solo album or the James Young Group album, listen to the backup vocals. They sound like Styx. As a lead singer, he's not my favorite. As a harmony singer, man, you gotta have him in there. Gowan's voice is also better than it's ever been. He was great as well. brywool wrote: Saw Styx the other night. Tommy's voice is so much better than it's ever been. Saw Dennis a few months ago - also great. I hear him going into head voice in different parts than he used to, but it's big and full. He sounds great. These guys know what they're doing vocally. Jy's voice has been beaten up, which is sad. People don't give JY enough credit. His head voice is such a big part of the Styx Harmony Block. If you listen to his solo album or the James Young Group album, listen to the backup vocals. They sound like Styx. As a lead singer, he's not my favorite. As a harmony singer, man, you gotta have him in there. Gowan's voice is also better than it's ever been. He was great as well. JY certainly is part of that Styx harmony sound signature. That signature was DDY\TS\JY and for me at least, you can't duplicate it using other people. 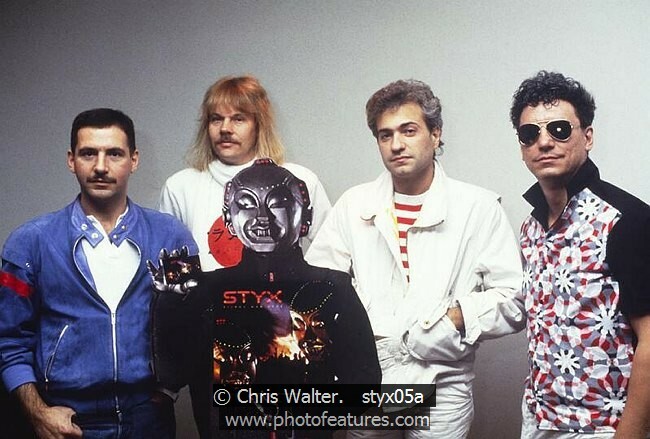 This is one of the main factors for my loss of interest in the band now known as Styx. As far as JY on lead vocals, I liked his performances on the WN releases the best. It's truly sad that special magic has been lost forever. JY's best vocal performance ever was Great White Hope. One of my top five styx songs ever. masque wrote: JY's best vocal performance ever was Great White Hope. One of my top five styx songs ever. Yeah, I agree with you on that. Also You Need Love. Yeah, I agree with you on that. Also You Need Love and Midnight Ride. If you don't like Styx doing Styx because it isn't the DDY/Tommy/JY combo, does that mean you don't like Dennis doing Styx because it isn't the DDY/Tommy/JY ?? Jesus loves you ,but everybody else thinks you're a knob. These Are the Times, Young Man, Miss America, & Heavy Metal Poisoning are my picks for JY's best vocal performances. DDY is no longer in the band. I am not a fan of Gowan on songs where DDY was the lead singer. I didn't like how they handled DDY's departure and things they said and did after the fact. They are not playing songs I would like to hear when seeing them Live. What you have is a version of the band that is different then when DDY was part of it and it just doesn't interest me anymore. I gave them the benefit of the doubt and saw them live post DDY's ousting. They didn't do anything that motivated me to want to see them again. As far as DDY's band and live shows, it is more to my liking. He plays the stuff I want to hear. His show is structured like Styx shows used to be. I get to hear DDY sing his songs, not a replacement. No the harmonies are not the same but the other things I like about his group and live shows outweighs that. It's all a personal choice. I don't expect everyone else to think or feel the same way. I'm not looking to convert people. If you are happen to like Styx as they are now, then more power to ya. I have always loved that Tommy/JY and Chuck ended up standing up to Dennis for being Mr. Bossypants.I wonder if Dennis regret a few things, and wish he had done things differently now.? I guess if you are a Dennis fan, you get Babe and Suzanne as backup singer. Well good for you. It doesn't impact what I or anyone else here chooses to do. Don't expect it to impact what you or anyone else chooses to do.Why would I.? But these things don't happen too often does it ? I sided with Gilmour/Wright and Mason too. How's Parlin, N.J. these days? Parlin is great Boomer,just great. Last weeks bake and boot sale sales ,were a lot better than expected. Aunt Millicent's beluga burgers were sensational. I found some Herb Albert and Chuck Mangioni albums ,I didn't have in my collection. The pumpkins looks amazing this year.It could be the best crop we have had, ever. Serge,my hair stylists in Titusville FL for a couple of weeks. You should drop by sometime.Don't be bashfull,ya'll hear. "Mr. Bossy Pants" turned Crystal Ball into a prog. rock song with a chorus and encouraged Tommy Shaw the step in the spotlight! Mr. BP turned Shaw’s acoustic Crosby Stills and Nash style demo into a rock song called Renegade instead of all 3 part harmonies! Mr. BP against JY and mgmt wishes had TS record Boat on the River giving Styx and TS arguably their most important song outside N America! Mr. BP refused to replace TS over the objections of JY, JP and CP when he left Styx to go solo!!!!! Mr. BP asked TS to re record Lady in 1995 which led to the 1996 and 97 reunion tours!! Mr. BP found a way to keep the balance between the song writers from Crystal Ball to Kilroy Was Here. Glen Burtnik lasted one album in Styx when it was clear he would be given less then what he got when Mr. BP was producing! Mr. BP mixes including Renegade and BCM are the ones we have been listening to for the last 40 years! How dare Mr. BP ruin my favorite band!!!!!!! Mr. BP spends 500k on Kilroy 14 minute movie against the rest of the bands wishes. I agree. I thought JY’s best vocals were with the WN albums as well. He has his moments obviously from Equinox to PoE, but it ends for me there. Here we are talking about ,when Dennis' new album is coming out.? ...and if Dennis has regretted some of the things, that got him fired.? You talk to Dennis,so has he said anything about either ? If not?.Maybe you could ask him about those things.? Did you forget, for Crystal Ball was in the making,Dennis didn't really feel he had much to offer, hence his encouragement to Tommy. There has been pictures recently posted from August facebook page with him in Dennis' studio, and of Jim Leahey in Jim Peterik's studio with Dennis. It would appear they are cutting more than demos at this point. I've listened to Jim Peterik's podcast and he has mentioned they have written around 20 songs. If anything Peterik will keep this project on track I believe. I'll find out. I hope there will be more positive postings on this forum. I miss posting here but I'm sick of the negative postings, by the way. Same here, I very seldom come here anymore. Too much negativity, and no more updated reviews on the main page. I am confused by what you meant on----"Mr. BP found a way to keep the balance between the song writers from Crystal Ball to Kilroy Was Here. Glen Burtnik lasted one album in Styx when it was clear he would be given less then what he got when Mr. BP was producing!"